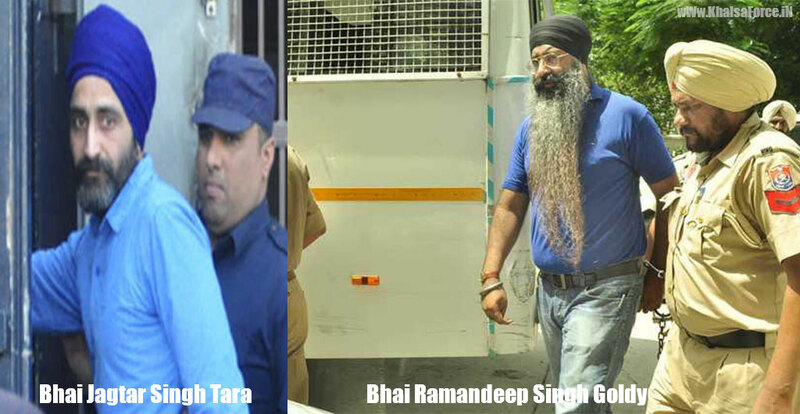 NEW DELHI—Political Sikh prisoners Bhai Jagtar Singh Tara and Bhai Ramandeep Singh Goldy on May 2 attended the Court hearing in Rulda Singh murder case. Bhai Ramandeep Singh Goldy was produced before the Court of Justice Arun Gupta under strong security arrangement while Bhai Jagtar Singh Tara attended the Court hearing via video conference. Rulda Singh was the state chief of Rashtriya Sikh Sangat (RSS) in Punjab. He was shot at outside his home on July 28, 2009 immediately after his return from England. He was rushed to Post Graduate Institute of Medical Education & Research (PGIMER) where he succumbed on August 18, 2009. On the complaint of Rulda Singh’s son-in-law, the Punjab police had registered an FIR No. 279/09. Initially, the Police had indicted Bhai Darshan Singh (Makrudpur), Bhai Amarjit Singh, Bhai Daljit Singh, Bhai Jagmohan Singh and Bhai Gurjant Singh in September, 2009 but later the Court had acquitted all of them in 2016. Trial against Bhai Jagtar Singh Tara and Bhai Ramandeep Singh Goldy was pending as they were extradited to India from Thailand and Malaysia in January 2015 and November 2014 respectively. The Punjab police have also inducted names of Babbar Khalsa Chief Wadhawa Singh Babbar, Paramjit Singh Pamma, Harjot Singh and Jagdev Singh in this case.